CHICAGO (Sept. 12, 2017) – Washington Spirit defender Whitney Church was voted the National Women’s Soccer League (NWSL) Player of the Week by the NWSL Media Association for Week 20 of the 2017 NWSL season. Church, 24, scored the first goal of her NWSL career to help rally the Spirit to a 2-1 road victory over Sky Blue FC as Washington snapped a six-game winless run. Church also turned in a strong effort on the defensive end with seven interceptions, four clearances, three blocks, two tackles and she gained possession 12 times for her club, according to Opta. The all-around performance from the center back helped Washington to their second away win this season and was instrumental in the Spirit conceding fewer than two goals for the first time in seven games. The Penn State product has missed just one game in 2017 and played every minute of her 21 appearances she has made this season. 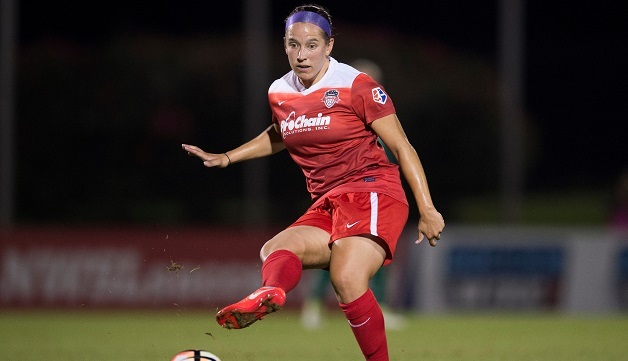 It is the first time Church has been honored as the NWSL Player of the Week and the 12th time a Washington Spirit player has won the award. Church is the third different Penn State player to be named NWSL Player of the Week, joining goalkeepers Alyssa Naeher and Britt Eckerstrom as winners of the accolade. Nittany Lions have now claimed the award five times – tied with the University of Portland for the fourth most all-time by a single college. North Carolina leads the way with Tar Heels being named NWSL Player of the Week on 13 different occasions. West Coast powers UCLA and Stanford are tied for second as both schools have had their former players earn the honor a total of six times each. The Washington Spirit will return to action against the Boston Breakers on Saturday, Sept. 23 at 7:30 p.m. ET at Maryland SoccerPlex in Boyds, Md.